Whew! Note to self: don’t get sick on the first week back to school! This week we had 3 teacher days (meetings, more meetings, and working in our rooms) 1 open house, and 2 days with students- and boy, am I exhausted! 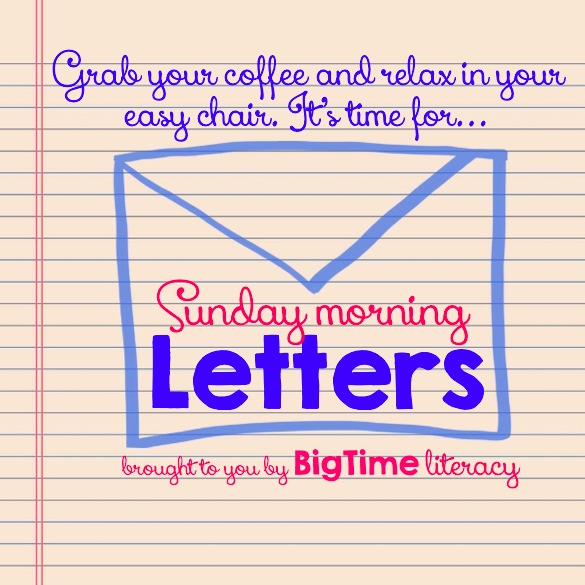 I’m linking up with BigTime Literacy for Sunday Morning Letters- a fun way to give you a window into my thoughts and feelings about this week! Thank you for being incredible to me this week. You have checked in on me, fed me, lent me things, shared ideas, and even offered to let me take a quick nap at your house on a day I was feeling very sick (since I live almost 30 minutes from school). You are organized, flexible, understanding, and helpful- and I find myself feeling so blessed and excited for this year with YOU as my team! You somehow did everything I asked you to, and yet I wasn’t thrilled with the result. I’m not blaming you, but I’m not loving it. That said, you adding in an extra mini-facial and short scalp/shoulder massage because it was my first time at the Aveda Institute was JUST what I needed after a tiring first day of school. P.S.—Thanks for not stressing me out too much about having your daughter in my class! You know I love you. I do. But when I’m labeling every one of your books, it would be really nice if you weren’t QUITE so huge. Same goes for when I’m moving those same books back to school. And organizing them. And labeling the baskets. So… maybe just don’t grow TOO much for awhile, okay? Despite working second shift and hardly seeing me this week, you did an amazing job of checking on me, picking things up for me, offering to help, and basically just being super supportive when I needed it most. I love you already. I missed having a class, and I can tell you are going to be fun. Now, we still have a LOT of work to do when it comes to listening, following directions, meeting the expectations, following procedures, etc… but you are a very sweet class, and I am loving your creativity and excitement for school! I really enjoyed linking up for this fun way to recap my week! How was your week? Last week at a PD training, a presenter showed us the most simple but totally engaging way I’ve ever seen to introduce a new topic in the classroom. Absolutely one of those, “how have I never thought of this before?” ideas- which is why I had to share it with you during this month’s Bright Ideas hop! Ask the students what this is, and what evidence they have to support it. Kids might say a mountain, a canyon, etc. based on the creasing and shape. Next, show them this one. Hmm. What do they think it is now? Do they notice the dark spot, and what do they predict that might be? Do they see the little bit of white in the corner? Ooh- now THIS one should change some minds. Now they might not think it’s some sort of landform. Maybe someone will guess that it’s an alligator? Now, with this photo, will they still think alligator? Someone might explain that the teeth look different, or that the snout is rounded. Maybe they’ll notice the missing teeth, and wonder why teeth might be missing. Did you guess the photo puzzle right? Today we’re learning about DINOSAURS! There’s also a popular game app called 4 Pics 1 Word, where players are given four seemingly unrelated pictures and have to find the word that ties them all together. For older kids, introducing a new unit or novel with a puzzle in this format would be a lot of fun. Can you tell what this one would be? And could you picture having students create their own for books they read, or concepts they’ve learned about? What a thought-provoking hallway display and fascinating assessment it would be to have them create and explain these! 3) Zoom in and crop sections of the picture. You can use a photo editing program, or just take a screenshot. On Windows, you can press your keyboard’s PrintScreen button to “copy” a screenshot to your clipboard, or even easier- use the program Snipping Tool (which probably came on your computer but you didn’t know it!) to save just part of what’s on your screen with no cropping needed. On a Mac, look for the program Grab (also already there!) or click Command-Shift-4 and then check your desktop. Of course, you could also put your images into a PowerPoint for easy display, or use a program like Picasa to easily create a collage for a “4 Pics 1 Word” style image. Be sure to visit some other entries in the Bright Ideas Blog Hop, too! If you’ve never browsed through one of these before, I highly recommend it- there are over 200 high-quality, 100% ad-free ideas from some of the best teacher bloggers out there! Today- with less than five days of summer to go- I looked at my To Do list from June. The number of things not-crossed-off is STAGGERING. I had the whole summer, people. For the first time since I was 15, I wasn’t working a job all summer. TpT (and my husband’s job) have finally made it so that I could take a summer break, and I had such grand plans to get so much done! If I didn’t do this stuff during the summer, when am I supposed to do it? I’m looking around our apartment and thinking, “Summer was supposed to be my time to catch up and actually clean up this place!” annnd yet my dresser is still piled with clean clothes to be put away, my coffee table is covered in papers to file, and my bathroom counter is a disaster area. I really should have done that. And the appointments. With my school’s hours and my commute, I leave the house around 8 and get home around 5. The summer is the perfect time to fit in every appointment with my doctor, eye doctor, dentist, accountant, etc.- and I got maybe half of them made and done. Definitely should have made that happen. Did I mention I should have gotten my car fixed during the only extended time during the year when I don’t need to drive it every day? And don’t get me started on all the things I should have done for school. Even worse? There are FUN things I didn’t do! Pool day? Totally doable- part of our apartment rent pays for pool access and I can literally walk to it- but NOPE. I didn’t go to the pool ONE time this summer. Amusement park? There’s a nice one less than half an hour from me, and I didn’t spend even one day riding roller coasters and eating blue ice cream. Zoo? I love living in a city with a great zoo. I thought I might get a membership and go a few times… but I never even made it there once. There were so many things I should have done! Recipes to be tested. Crafts to try. Blog posts to write. Products to make. Places to visit. Letters to write. Workouts to do. Seriously! June, July, and half of August, and what do I have to show for it? I am ready and excited to go back to work! I can look at all those things I should have done this summer, or I can look at what I did do. I was a little productive- but I also slept in. I read books. I went on vacation. I hiked. I took naps. I spent time with friends. I took photos. I binge-watched a TV series. I wasted hours on Pinterest. I spent full days in pajamas. I ate ice cream like it was my job. Most importantly, I spent time with those I care about. I hung out with my husband (who works second shift, so I don’t see him much on weekdays during the school year). I spent hours every day with our newly adopted dog (who is the CUTEST thing and loved every second). I visited family , hosted friends, and met new friends, too. Simply put? I made summer break a BREAK- and honestly, I don’t regret it much. Teachers give, give, give through the school year. Sure, the average person doesn’t get it- but beyond the hours I spend at school (too many), I come home with a bag full of work, a mind that can’t stop brainstorming, and a heart still stuck on worrying about my kids. Never mind the stress of new standards, new teacher evaluation systems, drama with co-workers, and all of the other complications we face. I love what I do- but (probably like most teachers) loving it so much and caring so much means that I run myself ragged sometimes. It’s hard to not pour your entire soul into teaching, and it’s as exhausting as it is fulfilling. And by the summer, sure, it feels like I should have used that time to catch up- but what I really needed was a break, and I am so glad (for once) I took it. So despite that To Do list nagging me about the summer that “should have” been, I can honestly say that I will be a BETTER teacher to my kids this year because I gave myself a true break this summer. And I’ll be happier, too. All teachers know that kids learn more when they’re excited and engaged. Today a team of bloggers come together to help your students take a BITE out of learning with a theme your students are sure to love! One way I help my students get excited about learning is to add their names into my lesson examples and our math problems whenever I can. It helps spark their interest and sometimes I can show something I know about them (for instance, if I know Danny plays soccer, I can do a math problem about his minutes of soccer practice). Of course, picking topics the students are interested in always helps, too! My Shark Week freebie is a multisyllabic word game featuring the phonics pattern "-ar." My multisyllabic word games are all about helping kids "chunk" and decode bigger words! In this game, the "ar" is underlined in the word to help kids recognize the pattern, while still giving them practice with decoding longer words. Of course, to make the card game fun, there are some "SHARK BITE!" and "DOLPHIN RESCUE!" cards thrown in! This game makes a perfect center or Word Work game. 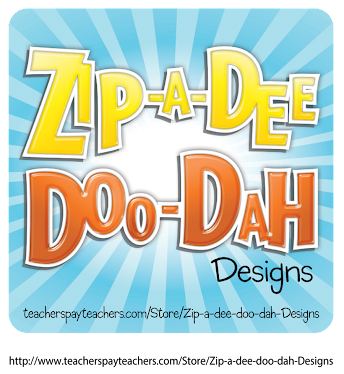 My RTI and tutoring kids LOVED this kind of game last year! Click HERE to try it out for FREE!